Prisma City is in trouble. A few years after the heroic "de Blob" and the Color Underground restored the city to its rightful vibrant hues, the nefarious INKT organization is up to its old tricks, turning everything to various shades of gray. Blob must once again take up the proverbial prismatic banner to save Prisma City from its dreary monochromatic fate - and he's going to start with soda. Yes, soda: We jumped into the game in Prisma City's soda-manufacturing district, where once seven distinct towers had produced seven different and colorful flavors of soda, from a bright yellow lemon to a tangy orange and chocolatey mocha. Now, however, they had been all appropriated by INKT to produce naught but Blanc Cola - an ink-black sludge that drains the color from everyone who consumes it. As with the first game, Blob must soak up paint of various colors and bounce and roll his way across the buildings to repaint them. Painting surfaces (and friendly NPCs) will consume his color charges, as will attacking enemies with moves like his new rolling dash attack - or worse, getting hit by them - and when Blob is out of color, he's kaput. Falling into ink (or the murky Blanc Cola) will turn him an oily black, hindering his platforming abilities and preventing him from picking up any new colors until he finds some water with which he can rinse off. He'll also be facing new types of INKT enemies, like special troopers that will shoot him down if he jumps, others that will counter his default homing attack, and swarming spider bots that will latch on to him and explode. In other words, restoring color to Prisma City is going to be a bit more complicated this time around. Whereas Blob could be content to simply paint buildings' exteriors in the first game, that wouldn't be enough to stop the production of Blanc Cola here. Instead, the player must steer Blob to the top of the tower in question with enough color charges to open the hatch that leads inside - which can mean some backtracking to refill if you aren't using your color wisely. 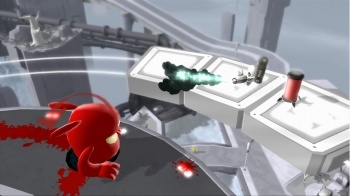 Once inside, de Blob 2 takes a turn for the 2D - as opposed to the fully 3D platforming segments in the outer world of Prisma City, the indoor segments are that of a 2.5D platformer. They're never all that complicated and simply involve exploring the hallways, dodging obstacles and hitting switches that unlock new areas - but the game will occasionally throw traps at the player, which means you can't turn your brain off and go on autopilot the whole time. That said, there's something strangely Zen-like about bouncing around a world, splashing color everywhere and using homing jumps to quickly smash between switches, jars of paint and enemies. Things are slightly compounded, though, by the fact that almost everything you do is on a timer - and this includes simply bouncing around the exterior areas making it to the next challenge marker. While you'll often be awarded liberal amounts of bonus time for completing objectives and doing even minor things, so running out of time is rarely a genuine threat, its omnipresence makes it hard to just sit back and relax with Blob - and you're more likely to do something foolish when you know the clock is ticking. One puzzle to paint different sections of a building different colors had me frantically mixing paint trying to make everything just right, panicking as the time ran out - and completely ignoring the new Rainbow powerup, which would have painted every surface the color it needed to be. The first de Blob was a Wii exclusive, but de Blob 2 will be on PS3 and Xbox 360 as well, with full 3D support in the case of Sony's console. It looks nice, sure, but it's hardly a game one needs HD graphics to enjoy - it's mostly silly, mindless fun that one can enjoy without having to think too hard about it.